There is no other sanctuary like this one, where each animal is a special being. Meet Chappis – she loves her life here with us – especially since she almost died 8-years ago. Chappis is a joyful little dog. And though she limps on both rear legs, she manages to get around really fast . . . enjoying her big yard and her best friend, Wookie. She had the desert’s deadly tick fever, and it was in advanced stages when I first got her to our hospital. It was touch and go for months, but she pulled through, thanks to caring people like yourself. When she was well again, Chappis began to think that maybe this was all a dream . . .
. . . going from starvation and disease to a peaceful mountain-top sanctuary where she had her meals handed to her, and where she had her own house, and a warm bed. She was so unsure of her fate that Chappis defended each meal as if it were her last. As a result she had to live alone in her yard. Fortunately, she had many neighbors to talk to. Then eventually there was Wookie. He is a happy-go-lucky kinda guy, and he loved Chappis at first sight. They have been married ever since, and not once has there been a squabble over supper. They share everything. When Chappis was six, we noticed her beginning to have trouble walking. Turns out she had a narrowing of the discs in her back . . . like many of us do . . . and now she has arthritis in her rear legs too. But with a new flat yard, and medication, Chappis runs around as if nothing is wrong. She is a sight to behold. 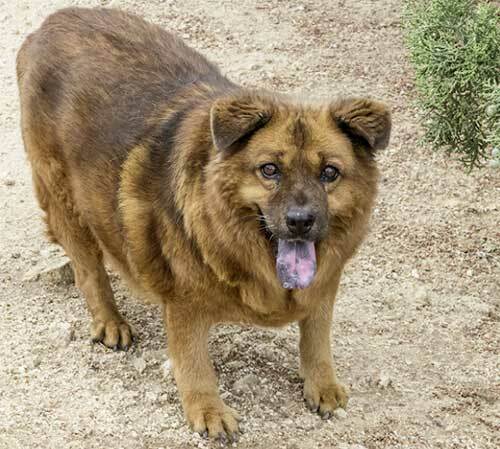 Chappis is a chow mix, short and stocky, and she waddles in such a way that you want to just pick her up and hug her! 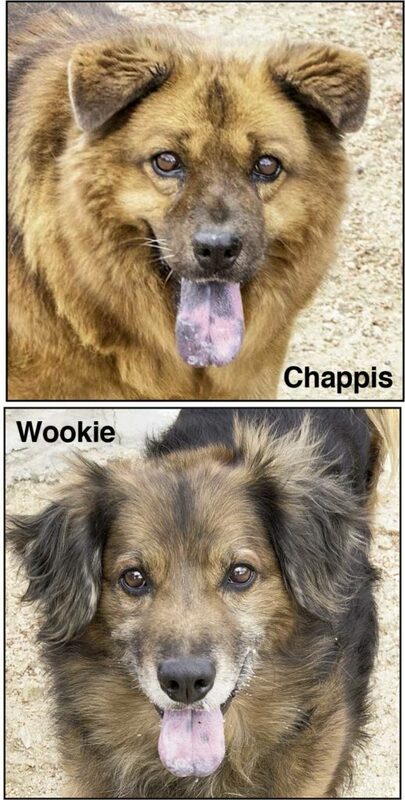 Wookie, who turned out to be the perfect match for our Chappis. He posed for me so many times I had to take his picture too! Wookie reminds me of the dog down the street whom I grew up with. He was every kid’s friend. We all shared whatever we were eating with him. Wookie wasn’t so lucky. He was thrown out in the desert and he had to fight tick fever and hunger at the same time. But now he is safe and loved and married to Chappis. And he loves romping around his yard telling us how happy he is to be here with us! I must confess now . . . . I have rescued so many cats and dogs over the decades that I noticed a major shortcoming in my life. And it is that I lose touch with most of my rescues after they come into our sanctuary. I am so busy raising money to ensure the future of this mission, and in becoming obsessed with the rescue, or even the health, of one particular animal, that I don’t have time to visit the many hundreds of angels living at the largest sanctuary in the world . . . which I have built! There is no other sanctuary like this one, where each animal is a special being, and where she is cared for, fed, loved and treated for every medical condition that can afflict her for the rest of her life . . . never to be harmed again! It takes an enormous commitment of time and money to keep our high standards for each of our animals. And in almost forty years, nobody has tried to copy us . . . because they can’t. It is incredibly hard to be so diligent that you demand perfection from your staff at all times. Each attendant must be inside each dog’s yard a minimum of 14-times a day, to care for him properly. Nothing less is satisfactory. Am I intolerable?! Yesterday I visited Chappis, took her pictures, gave her treats, but then I had to leave to get to the computer to meet my publishing deadline for the monthly donor newsletter. But I suffer the emotional distress of missing my rescues, thinking of them constantly, wishing I were there with each one . . . in order to keep this mission alive for all of them, by asking you once again . . . . . . to send your best gift to these precious beings, today. Yes, Leo, I want to help you rescue animals abandoned or born in the wild, like Chappis and Wookie. Here at D.E.L.T.A. Rescue, your dollars pay for good food, medicine and the sheltering of over 1,500 living, feeling animals. Your life-saving gift will help . . . Rescue cats and dogs who are abandoned, or born, in the wilderness. Love and care for them daily at our “no-kill” sanctuary. Stop automatic donations at any time by calling us at 661-269-4010. Your gifts go directly to the animals… come see for yourself on one of our “MEMBERS-ONLY” tours. Please send your best gift to our animals today. And be sure to make them some of your most beloved heirs so that DELTA Rescue can grow beyond our mere lifetimes.